Join us in our adventures through Europe... In 2009, we took a 12-night cruise on the Brilliance of the Seas... ...and in 2012, we have a 12-night cruise planned for the Serenade of the Seas. Join us as we discuss our plans, the sights, what we did right...and what we did wrong. In 2009, my husband and I embarked on a 12-night Western Mediterranean cruise that took us through Spain, France, Italy, Greece and Dubrovnik. In the summer of 2012, we're heading back...only this time, our three kids will be joining us, and it will be a 12-night Eastern Mediterranean cruise that will have us sailing through Spain, France, Italy, Greece and Turkey. This blog is a chronicle of our cruising experiences - the good, the bad, the ugly. It includes a day-by-day journal of what we did, how we did it, what we did right - and what we didn't do so right. Not only do we use this to "remember" our adventures, but our hope is that our story will assist others in their own planning. After realizing we had earned a free 12-night European cruise, our next step was figuring out when and where to go. I love Italy. Italy loves me. (At least it's food does). 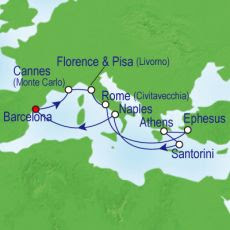 It was a no-brainer to choose the 12-night cruise that stops in Italy, as well as Greece, France and Turkey. We also love the Radiance-class ships on the Royal Caribbean line. So, it was a no-brainer to choose the Serenade of the Seas, which is a virtual twin of the Brilliance of the Seas that we cruised in Europe with in 2009. As far as our cabin, initially I had chosen the exact same cabin as we had before in 2009...a Grand Suite, on the hump, next door to the Royal Suite. I love the hump cabins - good views, good balconies, and good proximity to the central elevators and the Concierge Club. However, we're going to have three of us in the room - and one of those three is a pre-teenage girl. Ack. Who will need lots of space for all of her stuff. And space just to sprawl. (If you're a parent of teenagers, you know what I mean about "sprawl." So, I changed my cabin after our initial reservation to Cabin #1560, an Owner's Suite on Deck 10. My husband and I had this same cabin on our very first cruise ever, back in 2004, on the Serenade of the Seas. (That was a cruise to the Southern Caribbean). For the boys, being that they're...well...young, and won't be spending much time in their cabin...we've booked an Ocean View stateroom on Deck 4. All they require is a bed and a shower and a toilet. Not necessarily in that order. Oh, and food. So...we're set. I've made the deposits on the cabins and will be sending in monthly payments until they're paid off. Me: "Honey, how would you like to take another cruise?" Hubby: "You know I don't like to cruise. It messes up my balance." Me: "But. But. But. I LOVE to cruise! We could go back to the Mediterranean, where the waters are smooth, and you won't get as seasick." Hubby (with skepticism): "That still doesn't sound appealing. Besides - it would cost a fortune." Me: "But it would be half-price." I've learned over the years that if you mention "half-price" or "free" to my Hubby, you will most certainly get his attention. I now had his full attention. Me: "You know that Visa card we carry around and use all of the time? The one with the Royal Caribbean cruise ship on it?" Hubby: "Yeah...I know the one." Me: "We are the now proud owners of 250,000 points on that card. Which entitles us to one free 12-night cruise in Europe." And so here we are. We are now heading back to Europe in June 2012, for a 12-night Mediterranean/Greek Isles cruise on the Serenade of the Seas. 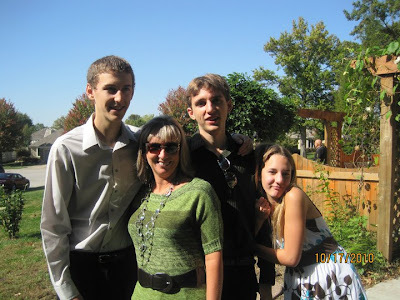 We're also taking three of our kids with us: Brad, who will be 22 years old at the time of the cruise; Taylor (son), who will be 19 at the time of cruising; and Mickey (daughter), who will be almost 13-years old at the time of the cruise. 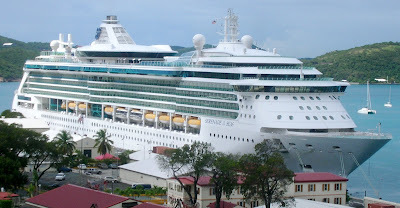 I'll be posting here about our pre-cruise plans, and then do another post-cruise review. Should be fun! Should be interesting! And it will ALWAYS be an adventure! Ahhh….the first day of our adventure….it seemed like this day would never get here. We arise very leisurely around 7:00 am and finish up our last-minute packing. After dropping off the daughter at her grandparents’ house, we arrive at Thrifty Car Park around 10:30 am. Thrifty is where our car will sit for the next 2 weeks – at $4.25 per day, it’s the cheapest that I have found. We are at Kansas City International Airport by 11:00 am and check in with the Delta Sky Cap, where we check our luggage. Our luggage consists of one large suitcase for each of us and one garment bag – shared. This will be checked. We each have a carry-on bag. Now, a side note. I hate to fly. I mean, REALLY hate to fly. I have severe panic attacks on planes that feel as if I’m having a heart attack. Especially if we hit bumps. I hate bumps. So – dear, wonderful Hubby had told me awhile back, “If I have to fly with you all the way over to Europe – it had better be in First Class”. I’m not sure what his logic is here – perhaps the bumps aren’t so bad in First Class? I think he was thinking of my comfort – If I’m more comfortable, than perhaps I won’t panic as much….? Whatever the case, we are normally NOT first-class fliers, but for Europe – we splurged. Once we board the plane, we sit in our seats – Seats 2C and 2D in First Class. We have drinks, pillows and blankets waiting for us, which is very nice. The flight is initially smooth, and then gets a little bumpy as we approach Atlanta. I hate bumps. Time to swallow a Valium. We arrive in Atlanta at 4:20 EST and immediately head to the Delta Sky Club for some wine, desserts, and snacks. We then board Flight 114 – non-stop to Barcelona. We are seated in 7A & 7B – the very last row in Business Elite on the left side of the plane. We have full-sized pillows and a large comforter waiting for us; we also get complimentary champagne upon arrival. We attempt to sleep but there is much turbulence for awhile – even with another Valium, I struggle to control the panic attacks I have upon flying. I guess I eventually did doze off…. We wake up at 7:30 Barcelona time (12:30 AM CST) and are treated with an omelet before landing in Barcelona. Landing is at 8:55 AM – and my pre-arranged taxi is not there. So we wait. And we wait. And we wait some more. About 10:00 AM, I start to dig out the phone number to call them (Barcelona Taxi), when Enrique comes running in, apologizing for being late, and rushes to get our luggage. He claims that he called the airport to see if our flight was on time and was told that we would be 2 hours late….huh? Enrique took us directly to our hotel, Hotel 1898. I had booked this online after reading some reviews out here on Cruise Critic. Our room wasn’t ready yet but they gladly held our luggage for us so we could go sightseeing. We hopped back in our little taxi with Enrique; we went on a 3-hour tour (sounds like the Gilligan’s Island theme song) – and we saw it all – everything Gaudi, the Olympic Stadium, museums, Columbus Tower, markets, shops, people – wow. My brain was on jet-lag overload. Here's a shot of Enrique and me walking into the Olympic Stadium, home of the 1992 Olympics. We loved Park Guell - which contains amazing stone structures and beautiful flowers. We could have spent all day in this beautiful park. This is a photo of Casa Mila - designed by Antonio Gaudi. It's now called "La Pedrera", which means "quarry." Supposedly, there are no straight lines on the outside of this building - it's all waves. At one museum, there was a gentleman out front playing a beautiful guitar. We stop to listen – I’m excited about getting an opportunity to hear some beautiful Spanish folk music – when the opening strains of “Hotel California” by the Eagles begin….Now, I love the Eagles – but in Barcelona??!! I just thought that was funny. Perhaps I was a slight bit jet-lagged. The Torre Agbar, or Agbar Tower, was recently completed. It's a water tower. It has many nicknames, apparently. You think??!! When our tour was over, Enrique took us to a little restaurant along Las Ramblas for some delicious tapas. Now, the Barcelona Taxi website said they would accept payment via credit card – but Enrique refused our credit card and wanted cash only. Luckily, there was an ATM machine right next door to the restaurant, or we would have been in trouble. That was a little frustrating for us – needless to say, he didn’t get as big a tip as he would have gotten if he would have taken plastic. Our lunch was delicious – the pappas brevas (potatoes with cheese) was our favorite. I ordered a hamburger and had to crack up when I saw the size of it. After lunch, we stroll up and down Las Ramblas – enjoying the street performers, the music, the people, the traffic – it was all new and it was all exciting. I love visiting new places. Did we ever feel unsafe – or scared of pickpockets? No – we kept our bags close and we were fine. We felt safe at all times. Around 2:30 pm, we walked back to Hotel 1898 only to find that our room was still not ready. Okay – the website said rooms would be ready by 3:00 pm and we’re a little early – so we’ll hang in the lobby and wait. We sit down in the lobby and there’s a couple also sitting, waiting. We begin talking only to find out that it’s our friend LarryKak from Cruise Critic – how funny! They introduce themselves as Larry and Kathleen. Our room was finally ready around 4:00 pm. The room was nice – albeit small – which is typical of European rooms. Hubby and I quickly crawl into bed to catch a few zzzzz’s….and wake up a few hours later to get ready for dinner. As I get ready to climb into the shower, I find a conglomeration of buttons, knobs, and instructions. There was a virtual thesis of instructions next to the shower on how to operate it…and after much trial and error, we finally got it working and at the right temperature. We meet up with Larry and Kathleen in the lobby and begin walking down Las Ramblas to Taller de Tapas for dinner. We had set up a dinner party for pre-cruisers on Cruise Critic for here – and after much walking, we finally found it. Flycruiser (Susan, Pete and Ian) were there already, and later, Tufy (Joe and Thelma) joined us. A great dinner of tapas – including risotto, more pappas, calamari – and then it was time to head back to the room – this was around 10:30 pm. Can you tell we talked a lot?! Here’s a great photo of the seafood risotto – we should have just ordered one and shared it. It was huge. When we got back to our room, we find it freezing! We never did find the thermostat, but managed to find an extra blanket which we used. (We found out from Larry the next morning that the thermostat was on the back wall of the closet. Who puts thermostat controls in the closet??!!!) I was in the restroom getting ready for bed when – guess what – the lights go out. Darn it. We’ve gotta remember to keep that darn key in the slot. We’re zonked out by 11:00 pm with thoughts of embarkation floating in our heads. First day impressions: Barcelona is a wonderful city – I would have loved to have more time in this amazing city. The architecture is beautiful; the people were friendly; and there is a lot to do. Impressions of Hotel 1898: beautiful décor; room was decent sized and very clean. Service was not sufficient – our room was ready 30 minutes late; Larry’s room wasn’t ready until after 4:00 pm – not acceptable when you’ve been traveling all day. Need better explanations from the bellhop about controls – the light control, shower control, temperature control, etc. Our alarm rings sharply at 7:30 am – time to rise & shine! I immediately lean over and smack the “off” button. Or so I think. Because 10 minutes later, another sharp ring – “time to rise & shine – again!” Darn it! Enough already. I pick up the Iphone and fiddle with the buttons, turning the alarm off once and for all. Oh no – my Iphone has other ideas – as 10 minutes later – you get the picture here. I obviously do not know how to work the alarm. Note to self – learn to do that before tomorrow morning. After being so rudely woken up, I get out of bed and stumble to the shower, where I manage to ACE the shower test today! I may be Iphone challenged, but I’m not European-shower challenged any more. Hubby gets up after me, and after we’re both dressed and reasonably put-together, we decide to hunt down breakfast. We leave the room and begin to stroll down Las Ramblas. I look at the little restaurants and café tables set up outside with envy – thinking, “That’s the way to eat breakfast while in Barcelona…watching the people…enjoying the fresh air…” But Hubby has other plans – he had spied a McDonald’s the day before and that is where he is heading. Are you kidding me? We’re in EUROPE and we’re eating at a McDonald’s?? I smile begrudgingly, and go along with his plan, but secretly I pout on the inside. We stroll back down Las Ramblas and find a delightful little café that is not only serving an “Americano” breakfast (their words, not mine) of scrambled eggs and sausage, but also churros con chocolate…..ahhh, heaven. That coffee cup on the left? Not coffee, honey – that is pure, thick chocolate – it was to die for. And the churros – another word for Spanish donuts – were excellent. I think I want to move to Barcelona. Hubby gets his “Americano” breakfast; I get a European breakfast (and chocolate?? For breakfast? I love this place!). We both get to watch the people stroll by; the motorbikes whizz by; and life is good along Las Ramblas on a Monday morning in June. We are right across from the Hotel Continental, where our new friends, Pete and Susan, are staying. We see a couple having breakfast on the balcony that look suspiciously just like them – we snap a picture – and hope that we don’t appear to be stalkers. We really aren’t stalkers – but we just thought it was funny that we see our friends on the balcony. Or at least we think it’s them – it’s kinda’ hard to tell when we’re this far away. Plus, we’re jet-lagged. And slap-happy. After our delightful breakfast, we stroll back to the hotel. It is 10:15 am; the taxi is due at 10:30 am to pick us up for the port. We get to the room and are leisurely packing when the phone rings at 10:25 am; the front desk gleefully tells me that our cab is here. Yikes! We frantically throw anything that’s not bolted down into our bags – no time to organize – and rush downstairs. Checkout was a breeze – as I had paid beforehand on the Internet, they told me to go and have a nice day. Thank you! I will! Aurelio is our driver today – wow, what a smooth talker. You can tell he is quite the player – he apologizes for not being our driver yesterday, saying that a family emergency had come up, and explaining how difficult it is to find drivers who can speak English. As we are driving, he gives us just a bit more information about the city. He tells us he hopes we got a picture of La Sagrada Familia, as they will soon be putting the underground metro under the church – and people are concerned that the church may tumble down (you think?!) We get to the port within 15 minutes and the ride costs $30 E. Hmmm… a little steep, but that’s okay. I am secretly glad that Aurelio was not our guide yesterday – although his accent is easier to understand, he drives with one foot on the brake and the other on the gas – I had a headache and a slight case of whiplash in just the 15-minute drive to the port. I couldn’t imagine spending hours with him yesterday. A porter comes up to help us with our luggage and directs us to the doors of the terminal. We walk in and there is already a long line for the regular check-in; the Suite Line has about 9-10 people (about 3 families); and the Diamond & Platinum line has no one in line. A no-brainer decision - we step into the Diamond/Platinum line. As we wait in line, we have to fill out a health questionnaire that asked if we had had any flu-like symptoms in the past 2-3 days….the H1N1 police are out and checking, which is fine with me. We are then handed a sheet of paper that said on the previous cruise, several cases of chicken pox had broken out….so be forewarned - especially pregnant women. Yikes, I thought – I would hate to come all the way over here, pregnant, and then have to worry about this! Eventually, we get up to the counter; I hand over my pre-printed SetSail paperwork & passport and credit card; she keeps the passports and gives us our SeaPass cards. Ours is gold with giant “SUITE” on it – hmmm….a little obvious, you think? No chance in being discreet. I am pleased to see that my pre-paid coke sticker is on my pass. However, I am a little not pleased to find they are keeping our passports until after our last stop. I guess this takes care of the, “Should I take my passports ashore with me?” question. We walk towards the ship and are stopped by a man who wants to see our SeaPass card and says, “Ahhhh….My Time Dining.” I had signed up for MTD awhile back online – and it is printed on my SeaPass card as such. He then pulls us over to his table and explains how it works (which I wanted to say, “I read Cruise Critic – I KNOW how it works!”) but I let him do his spiel, and he then asks what time we’d like to dine that night. I ask for 7:15 - he smiles funny and says “How about 7:00 or 7:30?” Fine; we’ll go with 7:00 pm. Once we get past the MTD police, we are stopped at the gate – they are not letting anyone up the escalator to board. It is just a few minutes after 11:00 am. We stand in a general group and wait – rather impatiently – as the minutes tick by. So close, and yet so far. There are duty-free shops here, and several people take advantage to go buy some liquor – but I do not want to give up my place in line and so I stay put. At 11:20 am, we are sprung free as the gate is removed and the huddled masses surge towards the beckoning escalators. Up we go – we get to the top and have to stop almost immediately for the Welcome Aboard photo paparazzi. Now – this presents a problem – we’re stopped – and yet there are masses of people coming up behind us on a moving escalator. The law of physics says those people have to go somewhere – as in OFF the escalator – and yet we’re stopped and cannot go any further. The people begin piling on top of us and much grumbling ensues – and comments of, “Hey – this wasn’t smart” as well as, “Hey – this is kinda’ dangerous.” You think? We can actually see the gangplank – so close, and yet so far! Finally getting to get on the ship! We all but have the ship to ourselves at this point – and so we take the elevator up to Deck 11 to check out the Windjammer. Dang – it is only 11:40 am and it is not due to open until noon. That honey-stung chicken will have to wait. We walk around the pool and there is not a soul there. We then wander into the Solarium and again – not a soul there. Okay, maybe one soul – I do see one person there on the left – but that’s it. No one else. Nada. We decide to take advantage of the solitude and so we stretch out on some loungers and close our eyes and just take it all in. Hubby quickly goes into a coma…but he looks really relaxed. At about 11:50 am, I notice that the doors to the Spa are now open – and so I leave Hubby happily dreaming happy cruise thoughts and I head over to make some appointments. Yes, I know the prices are outrageous – and I know they sometimes pressure you into buying the products – but I’m a heathen for pleasure and I can’t wait to have a massage and a seaweed wrap. I don’t know what a seaweed wrap really is – and I’m not sure at this point if it is something to eat – but it sounds good (I’m hungry, remember) and so I book it. Yay for me. Little did I know the problem that would result later – but that’s a later story – not for today. I head back to the Solarium and wake up Hubby and tell him that it is now after noon and we really must rush over to the Windjammer – beat the rush – and feed our grumbling tummies. My Hubby is a saint – he sighs, lifts himself off the comfortable lounge, and accompanies me to the WJ. The WJ has hand sanitizer machines at the entrance where everyone is asked to squirt down…which we do…and we are then confronted with a vast array of colorful and beautifully-displayed food….ahh, the joys of a buffet on a cruise ship. So many choices, so little time. Oh wait – I’m on a cruise ship – I have nothing but time! Life is good. I decide to head over to the dessert buffet – nothing like plunging right into “cruise mode” with the food, right? Besides, I’ll have 12 days to go to the gym and work this off. Yeah, right. As I am studying all of the delightful choices, I bump into Kathleen – and so we sit with Larry & Kathleen for lunch…out back…in the delightful sunshine. (Okay – it was overcast and a little breezy – but indulge me as I take a few liberties with the story.) We chat and laugh and sample and eat and drink…and before we know it, it is after 1:00 pm and time to head to our cabin. We part ways, promising to meet back up at the “unofficial” CC party later that afternoon. We head to our stateroom, 1556, on Deck 10. This is a Grand Suite, right on the hump, next door to the Royal Suite. 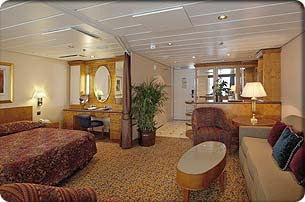 Here’s a shot of the sleeping area – as you can see, no life jackets on the bed; no greeting from our Cabin Attendant. Our C&A coupons are on the bar area, as well as my coke cup and a packet from the concierge. We settle in and lay down to take a nap when the doorbell rings – it is someone delivering a bowl of fresh fruit. How nice – but it would have been nicer if it had been accompanied by wine or champagne! We take a short nap and are awakened at 2:15 pm by the doorbell; it is our luggage arriving – wow, aren’t we surprised? And aren’t we thrilled? We found out later that some people still didn’t have their luggage until 9:30 or so that night. We unpack and I decorate the cabin with birthday decorations I had bought back home and packed in the suitcase. I will be celebrating a birthday on this cruise and I intend to make the most of it – and what better way than making the cabin festive?! Around 3:00 pm, our phone rings and it is Portofino, telling us that the Mystery Dinner was cancelled. No explanation. So sorry. Would we like to book another evening at their fine restaurant? Uh….I’ll get back to you. A little disappointed in the dinner being cancelled. Especially with no explanation. We find out later that we were one of the few people notified about the cancellation – many people were never contacted and went to Portofino that night, only to be told the bad news, and now missing their time for dining. The excuse was, “Well, we TRIED to get ahold of everyone – but we may have missed some people.” NO excuse! If that had been me, I would be upset. We lounge some more and 5:00 pm comes all too soon – time to “muster” up and head to the Schooner Bar for the lifeboat drill. Our lifejackets are not laid out on our bed, as had been in the past. We actually have to – gasp! – get them out of the closet ourselves and struggle into them. We DO have to wear our life jackets, darn it – but we were early enough we could find a seat in the Schooner Bar and it was nice and air-conditioned. Life is good. Hubby, wearing a lovely orange-colored ensemble, designed by…well, I don’t know who designed it – because if I did know who designed it – I would tell them to not make it so puffy because it is really hard to walk down the stairs and SEE over this thing – and who picked orange anyway? – because really, everyone knows that orange doesn’t go with ANYTHING in my closet….oh…..I digress….sorry. It appears that some people did not show up at their appointed Muster Stations – naughty, naughty! - as I could see the crew scurrying around and doing roll calls – and the Captain came on with several announcements on how it was mandatory. This rudeness on the part of some guests caused a delay for everyone, thank you very much. We had to sit just that much longer on these lovely, foul-smelling, puffy, bright orange vests. Shudder. After the drill…and after listening to the obligatory announcements in every language with the exception of Swahili (actually, for all I know, it COULD have been said in Swahili), we get to discard the jackets back in our room and let the party begin! It is now almost 5:30 pm, and so we quickly change into our party clothes and walk across the hall to the Concierge Club, where we introduce ourselves to Katherina Valenzuela, our Concierge for the week, and chit chat, all the while indulging in some delicious appetizers and a tasty Screwdriver. Why am I always so hungry on a cruise ship?? And why do I develop a sudden craving for anything alcoholic? Is it in the air? As more people wander in, we chit and we chat and then it is a little past 6:00 pm – time for our unofficial Cruise Critic Sailaway Party that I had arranged. I had coordinated our Cruise Critic Sailaway Party with the ship’s party – which was at 5:45 pm on Deck 11. Our own CC party was to start at 6:00 pm at the Sky Bar – on Deck 12. I had told everyone on our Roll Call that I would be wearing gold mardi gras beads that had a tiny martini cup attached – and everyone found me! Go figure! We had a great time meeting fellow CC’ers – it was nice to put faces with names! While we’re partying, Captain Hakan lets loose with the ship’s horn - and we are under sail! Yay – we’re moving! The screwdriver I had had in the Concierge Lounge is having a HUGE effect – I thought the ship was moving before it ever really was – and so I’m sure my fellow CC’ers got a kick out of me. At 7:00 pm, it is time for our MTD…we head down with several other CC’ers and all sit together at a large table. We had Dejan (from Croatia) and “Princess” Phumza from South Africa. They were very, very good. We liked them so much we requested their table every single night for the rest of the cruise. Dejan was going home at the end of this cruise - and in September, he is moving to the Oasis. If you see him there, tell him I said hello! I had the cheese plate as an appetizer – and the blue cheese was to die for. For dinner, I had the Vitality offering – the salmon – and again, I thought it was excellent. I always start a cruise off with good intentions – choosing the Vitality offering – but this will be short-lived. For dessert, I was good, and went with the sugar-free chocolate pudding. Ummmm…bland. Susan also had the sugar-free stuff, and Dejan ended up (without asking us) bringing us a strawberry puff to split. It was good…and we all laughed that he had read our mind. So much for good intentions – never again on the cruise did I order the Vitality offering OR the sugar-free dessert. Hubby had the pork medallions which he said were way too thick and too tough to eat…he then had the chocolate cherry cake, and as he demonstrated to us non-believers, was so hard you could have used it as a cutting board. Hubby is famous for always choosing the wrong things at dinner, and he did not disappoint once again. At 8:30 pm, we finished dinner and went and made reservations for same bat channel, same bat time the next night. We enjoyed our service and wanted to repeat it. We then made our way to the theater for the Welcome Aboard Show – it had actually began at 8:15 with Kieron Buffery, the Cruise Director, welcoming everyone – but we missed his spiel due to our dinner running late. The entertainment was an acrobat, Jean Claude, who was like a one-man Cirque du Soleil entertainer. Because we were late – and because there was only one show tonight for all guests – there was not an empty seat to be had in the theater. We stood along the wall for awhile and grew quickly bored – and so we left. Jean Claude was okay – but if you’ve seen a Cirque du Soleil show – then you will be disappointed in a “one-man” show. Just my humble opinion. It was now sunset – about 9:30 pm - and it was beautiful. It was so windy, though, that there were only a few other brave souls on deck to enjoy it as we did. Everyone had their camera ready to snap the awesome pictures. I was wearing a dress – and the wind was creating a few too many “Marilyn Monroe” moments for comfort– and so I quickly went back inside. I didn’t want to start the cruise with a reputation as being “THAT girl” who flashes everyone. At 9:30 pm, we went to the Colony Club where we played the “Where in the World Are You” trivia game – where we did horribly. Apparently, we have no idea where in the world we are. A couple from London nailed this game, and walked away with valuable Royal Caribbean Rubbish – as in a key chain. We found out later they have cruised over 50 times – well, heck – they’ve probably played this same game 45 times and have the answers memorized!!! No fair!!! We then stuck around until 10:15 pm for the “Name That Movie Tune” game – where we did a little better – but not quite good enough – to win one of the coveted key chains. If we had only known the Austin Powers theme song, we might have won. My quest is to have – in hand – a key chain before this cruise is over. I will not rest until the key chain is mine. It was now getting late and we headed back to the cabin so we could turn in. Our bed had been turned down – but there were no chocolates on the pillow and no towel animal. And still no sign of our cabin steward – we have yet to see him (or her). We also have yet to receive our invitation to the official Meet & Mingle Party, although several other CC’ers had said theirs was in the room already. Oh well….we’ll check on that later…or perhaps, we aren’t being invited on purpose??! Egads – has my reputation preceded me? First day impressions: ship is beautiful; service in dining room was excellent; food was hit-or-miss; cabin attendant is currently the “Phantom” and nowhere to be found; people are friendly – life is good and we’re on vacation. We settle in our nice comfy beds and dream about tomorrow, Cannes. After going to bed the night before at 12:15 am, but not falling asleep until at least 1:15 am, I was feeling pretty dog tired when out of a beautiful dreamless sleep, a constant and annoying noise kept sounding in my brain. At first, I was able to ignore such sound, but after repeated blaring, I struggled to some sort of consciousness to figure the source out…it was the ship’s fog horn…and it couldn’t have been any later than 5:30 am…and it kept blowing…and blowing…and blowing…. WTH?? Is this normal? Why would the horn blow at such an ungodly hour….? Unless…per chance…there IS fog???? Well, wonders of wonders – I eventually got up out of bed, peeked out the balcony, and saw fog so thick you could have sliced it up and served it for breakfast. Rest assured, the captain guided us through safely, earning his paycheck for the day. We pulled into Cannes around 9:30 am – and what a sight to see…absolutely beautiful…. After dragging myself out of bed, and getting cleaned up for the day, I head off to the Concierge Lounge for breakfast – the smoked salmon was absolutely to die for…very tasty…and I top it off with a chocolate donut. Salmon and donuts – what a way to live, huh? I am not a big breakfast person – I am never one to eat eggs or waffles or pancakes – so the Concierge Lounge is just perfect for me. Hubby manages to get up at 9:15 or so, and heads to the Windjammer where he has oatmeal and toast….says he was disappointed in the food selection, and once again, does not disappoint us in his selection of probably the worst thing in the dining room. While Hubby is away gnawing on his stale toast and chewing his lumpy oatmeal, I sit on the balcony and enjoy my breakfast, and then leave a note for Alston, our “Phantom” cabin steward. I leave my formal dress out to be pressed, and I request 2 copies each day of the Compass, as well as fresh ice each day. (Our bathroom water runs warm – I need cold water. We were NEVER able to get cold water out of our bathroom sink the entire cruise). I request two copies of the Compass as I want to mark one with the highlighter, and I want to bring one copy home for scanning. TIP ALERT: My sticky notes I took with us provide an invaluable means of communication with Phantom Alston, as I found out throughout the cruise. We have arrived in Cannes. Glimmering between St. Tropez and the Italian border, the sun-drenched shores and Mediterranean waters of the French Riviera form the backdrop for this fabled playground of the beautiful and wealthy. The Riviera, often referred to as Cote d' Azur, with its beautiful beaches and pleasant climate, has developed into a major tourist resort. Cannes, population of 78,000, was one of the first tourist resorts on the French Riviera. Millionaires give their bank accounts a workout in Cannes' splashy cafes, plush hotels, and cushy couture boutiques. Cannes is a tender port (and the only one on this cruise), and tendering begins around 9:45 am or so – and although we have priority tender tickets, Hubby doesn’t show back up from the Windjammer until 10:20. It apparently took him awhile to swallow that lumpy oatmeal. We head down to Deck 3 where there is a long line of people waiting – and we get to go to the front of the line. Priority tender tickets will do that for you. After arriving at Cannes, we walk up the red carpet (seriously) and are met immediately by Michel Legrand, our tour guide, from Revelation Tours, with a sign saying “Odell Party.” I feel so famous. The link for Revelation Tours is HERE. I highly recommend Michel, as you will see from the following review. Tell him Sherri says hi, if you ever use him! Erin & Bryan are already there. We wait for Andrea and Jim and their kids, Rae and Joey. They get off the tender around 10:50 am and so we load up in Michel’s van and hit the road. We begin by heading to St. Paul de Vence – down the highway for several miles and up a winding road. St. Paul de Vence is an enchanting medieval city that is northeast of Nice. Michel talks the whole time – giving us a complete history of the area….he talks and talks and talks – and never runs out of things to say. He drops us off at the Golden Dove Hotel, a place where famous artists would stay and sometimes pay for a room or a meal by doing a painting. Michel said that Picasso once had lunch at the Hotel and doodled on his napkin….Picasso eventually asked the waiter for his bill and the waiter said that Picasso could leave the doodled napkin as payment. Supposedly Picasso replied, “Young man, I only want to pay for my meal…I certainly don’t intend to pay for your hotel.” Arrogance, much? Michel drops us off at 11:45 am in St Paul and asks that we be back at the van at 12:45. He has given us a map of what to see and key points of interest in the town. We walk through the quaint tunnels and passageways of this village and I expect Belle (from “Beauty and the Beast”) to come walking out singing at any moment. Laundry is hanging from the windows; flowers are blooming – it is lovely. Here's Hubby and I on the streets of St. Paul de Vence. We walk to the top of the village and find the cemetery where the artist Marc Chagall is buried. Chagall, who passed away in 1985, was one of the most successful artists of the twentieth century. As is the tradition, we leave a stone on his grave. We’re back to the van at the appointed time and hit the road again, where we do a quick drive through of Nice on our way to a scenic overview of Monaco. Here's another shot of Monaco - showing some of those twisty, windy roads that Monaco is famous for. – and are presented with a view of Monte Carlo and the sea above the clouds. We are at about 7,000 feet…and then disaster strikes. No, we don’t fall off the cliff – although Michel was very worried that one of us may do that! But – a cloud rolls through…obscuring the view. And so we wait…and wait…but the cloud was stubborn and refused to yield, and so I didn’t get that shot of a lifetime, but I sure have a great story. We hike back down the mountain and come across some old ruins that were damaged in World War II. Michel explained that what we are seeing is not "graffiti" - but "street art." We then head down the mountain and traverse on the same road where Princess Grace was killed in 1982. We later visit Princess Grace's tomb - but no photos were allowed there. We pass old forts, old monuments, quaint towns and houses, olive trees, orange trees – it’s almost sensory overload. We end up in Monte Carlo where Michel drops us off in front of the Grand Casino and tells us we have about 40 minutes to explore. We go inside the Casino and have to check our camera – no photos allowed. We walk into the Casino/Opera House lobby and gaze in wonder at the beautiful ceiling. We find out it is $10E a piece to get inside the Casino and you must have your Driver’s License or passport. Well, our passports were taken at embarkation, and so we were fortunate to even have packed our Driver’s Licenses, but we decided it wasn’t worth $20E to spend 10 minutes inside the Casino. TIP ALERT: Pack another form of photo identification as you will need it in some ports. We stroll back outside and see the Café de Paris and the Hotel de Paris. and walk through the beautiful Japanese Gardens and find a park bench to sit down, relax, and enjoy our gelato. Michel is right on time to pick us up and we now head to the medieval town of Eze. Easily one of my favorite places. Michel drops us off at 4:00 pm and we have until 4:45 pm to explore the castle/fort ruins. I feel like a rat in a maze – it is a virtual labyrinth of passageways and tunnels and stairs and grottos – you can’t get lost but it is sure fun to explore! Perched in an "eagle's nest" at the height of an imposing and superb cliff, the village of Eze and its light ochre church can be seen from afar. Small narrow roads, archways and superbly restored stone houses, shady squares, refreshing ancient fountains... we were soon seduced by the marvels of Eze. The village is so beautiful, it's hard to believe we had not stumbled onto a movie set... ! After buying some French soap in Eze, we get back in the van and then drive down the Grande Corniche road through St. Michel on the way to Villefranche. Awesome scenic views – hear the story behind the village of “Village who pays no taxes.” We drive back through Nice and stop and see the houses of the rich and famous, including Elton John, Tina Turner, Bill Gates, and Bono. At some point, we drive past Villefranche. It's beautiful. We’re all getting pretty tired at this point, but not Michel. He is still talking. He says that tour guides are told 2 rules: the 1st rule is to always know where the nearest bathroom is located. And the 2nd rule is to know when to shut up. He says he never really learned the 2nd rule. True! But he really is a charmer – and a smooth talker…very French! We drive through Cannes down the main street where he points out the famous sites that are related to the Film Festival…and then drops us off at the port at 6:55 pm. We have to wait in a bit of a line to get on a tender ship, and it is easily a 10 minute tender ride back to ship. We get off and go through security and it is now 7:20 pm. Yikes – we have MTD reservations at 7:00 pm with our CC friends – and so we run up the stairs to Deck 5 and rush up to the desk, where Erhan smiles and says our friends are waiting for us….which they were! Delightful dinner – I had crab cake as an appetizer as well as shrimp cocktail. Both are very good. I then had cheese tortellini for my main course and I thought it was tasty – and not overcooked, like some pasta dishes are. For dessert, I had the Chocolate Fondue but I am not sure why they call it fondue as it is really chocolate mousse. I don't remember what Hubby had - but I do remember he didn't enjoy it. He really needs to start ordering what I order. It would really make his life more enjoyable if he would just do what I say. Sigh. We all tell stories of what we did for the day and compare notes on excursions. It sounded as if we had one of the better excursions with Michel and Revelation-Tours. Dinner ends at 8:45 pm – and because the Abba Elite show (a tribute to Abba) was at 8:15 pm (and only one show again – what’s with that? What happened to 2 shows??? ), we missed it. So, no review. Oh well - I can always listen to Abba on my i-pod. Hubby and I said our goodbyes and then headed to the Thermal Suite in the spa. We relaxed while lounging on the heated chairs and watched the ocean going by out the window. It was past sunset but not too dark – so it was peaceful and relaxing. We were the only ones in there, so it was really quiet. We headed back to our room at 9:45 pm – and my Formal dress was waiting for me, pressed…I had my 2 Cruise Compasses I had requested; I had our Meet & Mingle invitations; Hubby had his tuxedo; and we had chocolates!!! No towel animal, though, darn it. My little “prompt” to Alston must have worked – although I still have yet to meet this guy. Impressions: 5-Star review for Michel Legrand; he was wonderful and really made France come alive for us. Service in the dining room was pretty good – although I continually have to tell my assistant waiter, Phumza, that I do not eat bread and will never eat bread – and yet she continues to ask me each time if I would like bread. Food is good – especially if you stick with seafood or pasta. Want to see what I'm up to now? Keep following my day-to-day adventures by checking out THIS blog!